20 CEUs for California licensed health care professionals including: RN, LVN, Physical Therapists, Pharmacists, Nursing Home and Residential Care/Assisted Living Administrators (NHA, RCFE, ARF, GH). Check with your state licensing agency for CEU reciprocity. This educational program is designed for community care professionals, owners and stakeholders practicing in every setting across the continuing care continuum. Twenty (20) hours of accredited professional continuing education are available for California Residential Care and Assisted Living Administrators (RCFE, ARF, GH, SFH), Foster Care providers, Registered and Licensed Nurses, Nursing Home Administrators, Physical Therapists, Pharmacists. Quest for Excellence™ is an accredited provider of continuing education through the California BRN CEP11897, BBS PCE2013, NHAP 1634, CCL 2000124, and PTBC. Please check with your state licensing board for continuing education reciprocity. 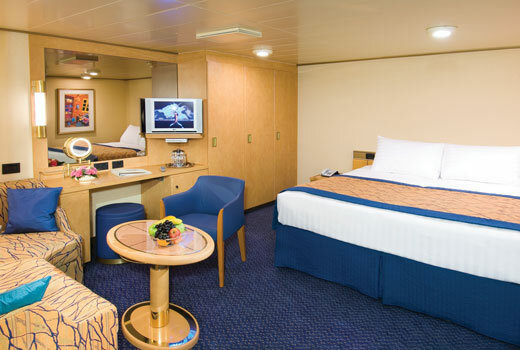 OceanView Stateroom with Veranda (VB) -Floor-to-ceiling window/sliding glass door leading to your personal veranda, 2 lower beds convertible to 1 queen-size bed, whirlpool bath and shower, sitting area, no-host mini-bar, floor-to-ceiling windows. 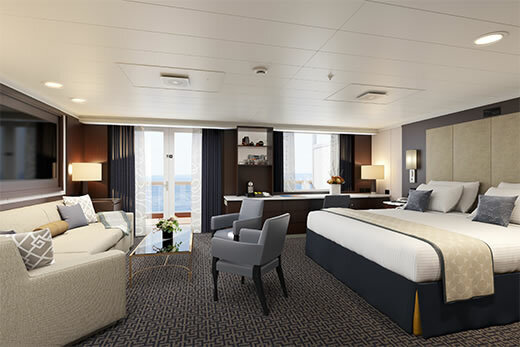 Includes all the stateroom amenities, plus signature Marinerâs Dreamâ¢ bed featuring plush Sealy PosturepedicÂ® Euro-Top mattress and finely woven cotton linens, luxurious bathrobes for use during your voyage, 100% Egyptian cotton towels, premium massage showerhead, 5x magnifying lighted make-up mirror and salon-quality hair dryer, fragrant soaps, lotions, shampoo and other bath amenities from Elemis Aromapure, complimentary fresh fruit on request, flat-panel TV and DVD player, ice service, shoeshine service and nightly turndown service. 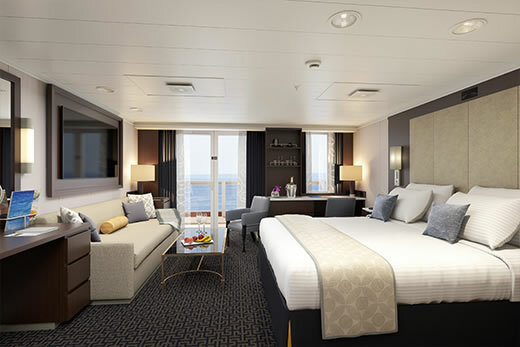 OceanView Stateroom with Veranda (VC)- Floor-to-ceiling window/sliding glass door leading to your personal veranda, 2 lower beds convertible to 1 queen-size bed, whirlpool bath and shower, sitting area, no-host mini-bar, floor-to-ceiling windows. Includes all the stateroom amenities, plus signature Marinerâs Dreamâ¢ bed featuring plush Sealy PosturepedicÂ® Euro-Top mattress and finely woven cotton linens, luxurious bathrobes for use during your voyage, 100% Egyptian cotton towels, premium massage showerhead, 5x magnifying lighted make-up mirror and salon-quality hair dryer, fragrant soaps, lotions, shampoo and other bath amenities from Elemis Aromapure, complimentary fresh fruit on request, flat-panel TV and DVD player, ice service, shoeshine service and nightly turndown service. 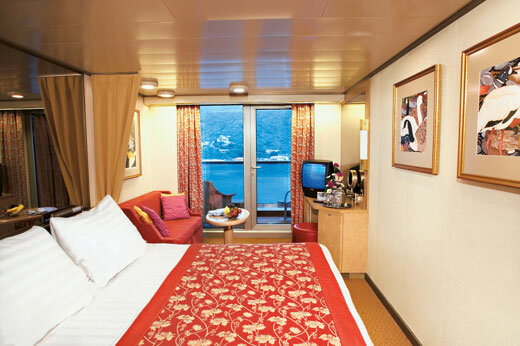 OceanView Stateroom with Veranda (VD) -Floor-to-ceiling window/sliding glass door leading to your personal veranda, 2 lower beds convertible to 1 queen-size bed, whirlpool bath and shower, sitting area, no-host mini-bar, floor-to-ceiling windows. Includes all the stateroom amenities, plus signature Marinerâs Dreamâ¢ bed featuring plush Sealy PosturepedicÂ® Euro-Top mattress and finely woven cotton linens, luxurious bathrobes for use during your voyage, 100% Egyptian cotton towels, premium massage showerhead, 5x magnifying lighted make-up mirror and salon-quality hair dryer, fragrant soaps, lotions, shampoo and other bath amenities from Elemis Aromapure, complimentary fresh fruit on request, flat-panel TV and DVD player, ice service, shoeshine service and nightly turndown service. OceanView Stateroom (D)- Picture window, 2 lower beds convertible to 1 queen-size bed, bathtub and shower, luxurious beds featuring SealyÂ® Premium Euro-Top mattresses and finely woven cotton linens, deluxe waffle weave and terry cloth bathrobes for use during your voyage, 100% Egyptian cotton towels, premium massage showerheads, 5X magnifying make-up mirrors and salon-quality hair dryers, fragrant soaps, lotions, shampoo and other bath amenities from Elemis Aromapure, complimentary fresh fruit on request, flat-panel TV and DVD player, ice service, shoeshine service and nightly turndown service. OceanView Stateroom (DD)- Picture window, 2 lower beds convertible to 1 queen-size bed, bathtub and shower, luxurious beds featuring SealyÂ® Premium Euro-Top mattresses and finely woven cotton linens, deluxe waffle weave and terry cloth bathrobes for use during your voyage, 100% Egyptian cotton towels, premium massage showerheads, 5X magnifying make-up mirrors and salon-quality hair dryers, fragrant soaps, lotions, shampoo and other bath amenities from Elemis Aromapure, complimentary fresh fruit on request, flat-panel TV and DVD player, ice service, shoeshine service and nightly turndown se889 535 105.70 rvice. OceanView Stateroom (F)- Picture window, 2 lower beds convertible to 1 queen-size bed, bathtub and shower, luxurious beds featuring SealyÂ® Premium Euro-Top mattresses and finely woven cotton linens, deluxe waffle weave and terry cloth bathrobes for use during your voyage, 100% Egyptian cotton towels, premium massage showerheads, 5X magnifying make-up mirrors and salon-quality hair dryers, fragrant soaps, lotions, shampoo and other bath amenities from Elemis Aromapure, complimentary fresh fruit on request, flat-panel TV and DVD player, ice service, shoeshine service and nightly turndown service. Partial OceanView Stateroom (G)- 2 lower beds convertible to 1 queen-size bed, bathtub & shower. 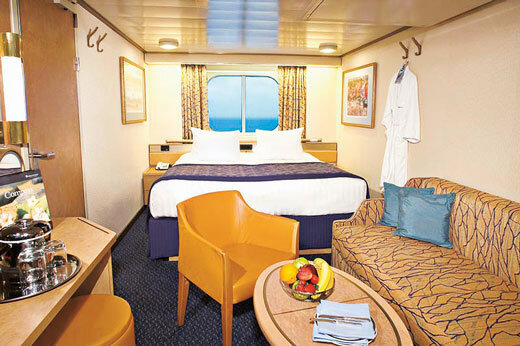 G-category staterooms have partial sea views, luxurious beds featuring SealyÂ® Euro-Top mattresses and finely woven cotton linens, deluxe waffle weave and terry cloth bathrobes for use during your voyage, 100% Egyptian cotton towels, premium massage showerheads, 5X magnifying make-up mirrors and salon-quality hair dryers, fragrant soaps, lotions, shampoo and other bath amenities , flat-panel TV and DVD player, ice service, shoeshine service and nightly turndown service. Prices are Per Person, based on Double Occupancy, subject to change. 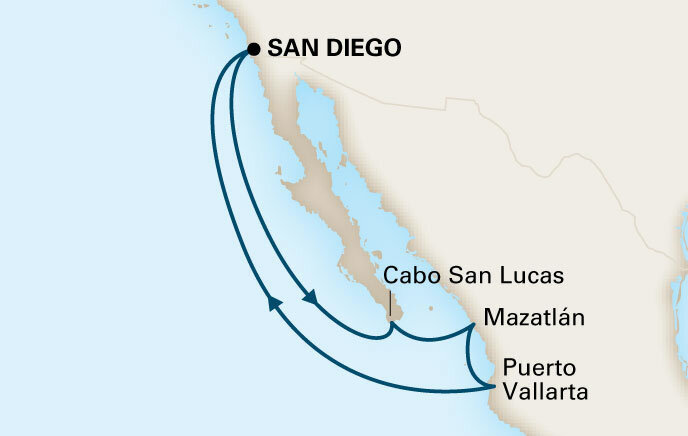 Price includes cruise fare, port fees , taxes and course registration. Guests not attending the class, please deduct $500 from above prices.